GUILD TOURNAMENT! Demons: +800% Health and Power, +25% 2X damage chance and faction bonus damage. Quick heroes: -90% power, -25% 2X damage chance. Another round of guild wars. Man I am just so exhausted.for this. Are the buffs for the quick heroes applied as described here? Brothers Dace teams didn't notice debuffs on ally death power+health gain and levy make them better than any of demons with all of theirs 99999% health and power. Last edited by Heal and Harm |VK|; 04-14-2019, 05:59 AM. Yeah, bonuses don't work well and this war is pretty slow. 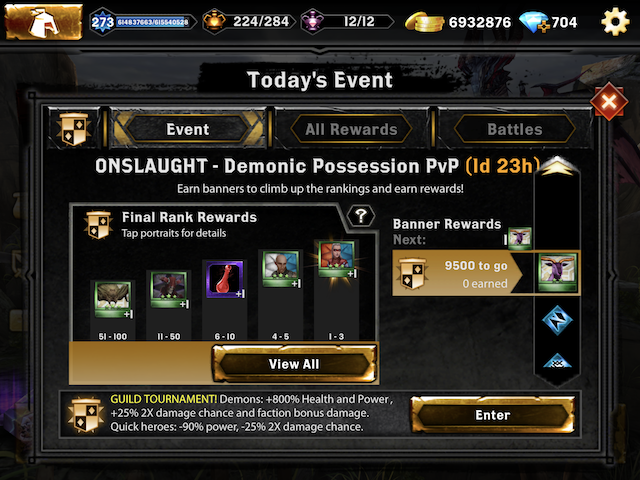 The game is reasonably mature and a lot of players will have fully maxed out heroes, and as Demons haven’t really been much of a priority they’re suffering badly against the usual suspects of squads with Daces and squads with Josephine’s, plus even blighted squads can take out Demons even when the numbers are in favour of Demons. You’ve disadvantaged fast hero power meaning Demons who get the bonus are in the medium to slow group which can then be subject to slowing and stunning, allowing enemy power cursers and drainers to make any feature bonus pointless. Something definitely does not seem right here. I believe the idea behind quicks getting -90% power was supposed to open up the event a little bit and make the normal and slow round demons more interesting and competitive but due to quick units not really being debuffed very much that definitely did not happen. I was still able to do very well and place top 500 but this war ended up quite a bit different than I expected. Is there a difference in an event having negative power to a group or faction compared to units imposing a negative power? Yes, the auras were all working as designed and intended. Keep in mind that event bonuses that are directly assigned to a group apply only to the base valuesfor stats, before any fortifications come into play. It does not affect fortifications. If an event bonus creates an aura for a hero to apply a negative value to enemies, THEN it happens after fortifications. Because this was a directly applied event bonus, you would still see the full fortification values. Thanks for the answer. Will have to keep this in mind for future events.